I was walking with a friend a couple days ago and we passed this child, sitting and playing on the sidewalk (that's his Dad at the right edge of the frame). 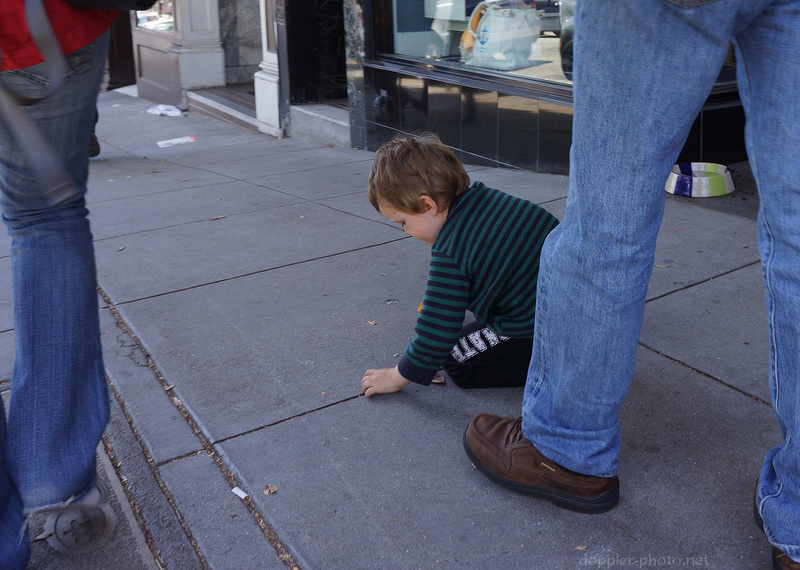 As we passed, he threw a torn rubberband in my direction, which is likely what he was digging for in the cracks of the sidewalk. I flashed them a smile — "no apology needed" — and walked on. I've been giving some more thought to loneliness over the past week or so, and it occurred to me that this momentary connection might form an apt analogy for street photography. We carry these cameras, attention transfixed on what we see in it or through it, and we can spend a while not actually interacting with anything but the camera. I know it happens to me. Then at times perhaps the camera catches someone's eye, and we flash a smile — "no harm intended, but you're kind of interesting." But it's not enough and they move along. We keep the photos, but maybe we miss the interactions?